We’ve been living in Wagga now for 10 weeks, and we’ve pretty much stayed close to home for the entire time. Yes, there have been a couple of overnight trips north to Bathurst for work, and day trips to Ganmain and Junee, but nothing really exciting (well, the Ganmain Show was very exciting, and the Junee Farmers Market a hoot!). More like, no trips to bigger cities, as Bathurst is about 1/2 the size of Wagga and Ganmain and Junee are just little villages. So it was with great anticipation that we took off to Melbourne for an extended weekend because Lisa had some meetings there. A bit of background on Melbourne: Melbourne is the capital of the state of Victoria, and is probably considered Australia’s “second city”. Home to around 4 million Melburnians, it is a bit smaller than Sydney (population of about 4.5 million people), but is growing at an extremely rapid pace. People from Sydney, however, probably don’t consider it to be a big city, much like people from Melbourne think that Perth (pop. 1.7 million) and Adelaide (pop. 1.2 million) are just small, remote towns. What must they think of Wagga? Or Junee! Well, in all honesty, they probably don’t think of these very often, if at all. 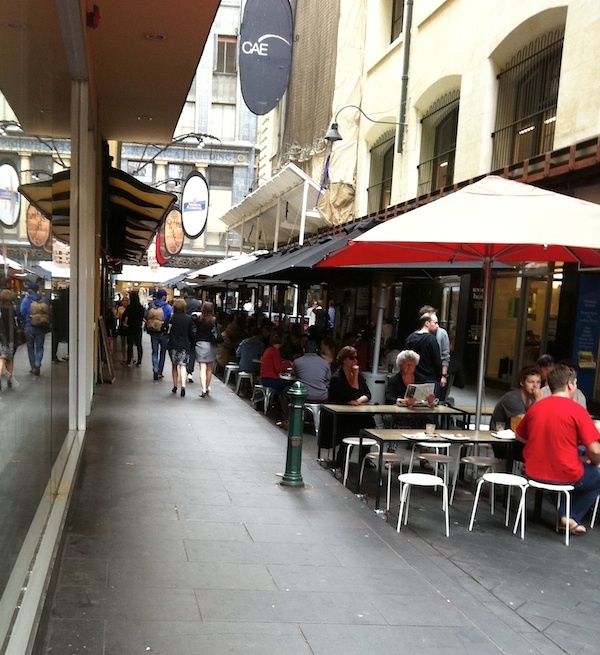 Melbourne's CBD is a warren of streets and lanes, connected by alleys full of coffee shops. This is where people congregate for food and coffee in the mornings. Despite its size, we don’t know much about Melbourne. It is overshadowed by Sydney, probably because Sydney is the landing point for most people coming into the country (not to mention all that coverage of the New Year’s celebrations on TV back in Canada). And because it has iconic landmarks like the Opera House and the Harbour Bridge. But despite its relative obscurity, Melbourne is a very nice city. It has everything we could think of wanting; it is very scenic (on a harbour, with the Yarra River running through the city), and it is quite easy to get around in (despite the spectre of ‘hook turns’, which we will tell you about in a future post). And it seems less frantic than Sydney. It also seems like people take it less seriously – Sydney people like to think Sydney is special, and it is – but not that much better than Melbourne. The attitude in Melbourne, however is much less pretentious. These are people who live in a great city and know they don’t have to keep telling people how great it is – the city speaks for itself. 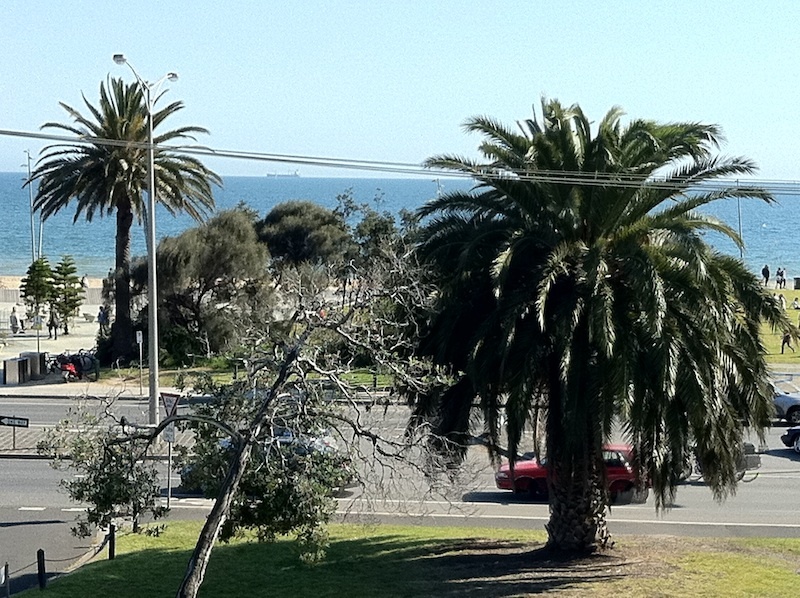 Melbourne also seems a bit less stuffy than Sydney. The CBD of Sydney is very corporate feeling, whereas Melbourne is a more bohemian culture; alleys lined with funky shops and coffee bars are where the life is. Add to that some great restaurants and a good public transit system, and it seems like a very liveable, and highly visitable, large city. Much of it is suburbs, but the central part of the city is a nice mix of modern and old, with some very nice architecture from both eras. After a long drive, we were thrilled that the concierge at our hotel recommended MoVida Aqui, a Spanish restaurant just around the corner, for lunch. Dan had actually read about it online, but didn't know where it was. It was so good we went back for dinner on Saturday, and bought their cookbooks. 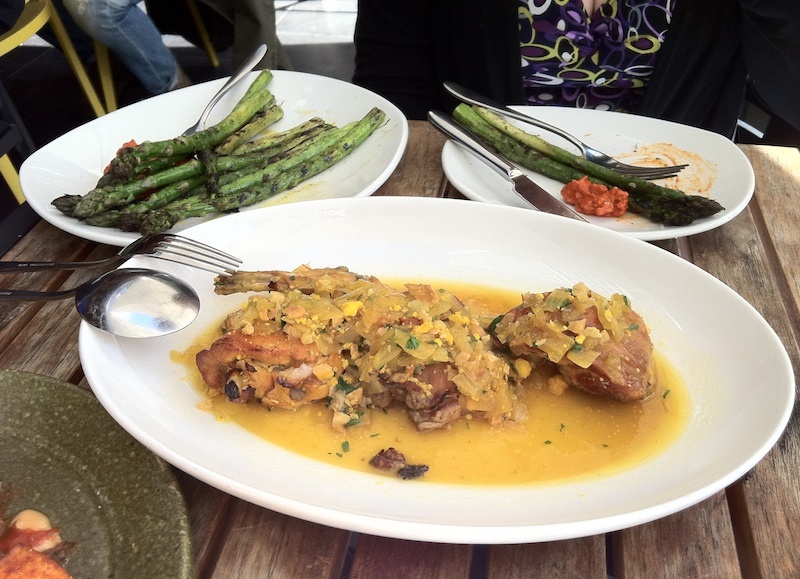 Above are asparagus with romescu sauce, and braised rabbit. Yum! There are a couple of ways you can get to Melbourne from Wagga: you can fly (REX air goes direct), you can take the train, or you can drive. We did the latter, and with a brief stop in Wangaratta (cool little town, we’ll be back for the jazz festival in October!) to pee and stretch our legs. It was 6 hours from the time we locked our front door until we were ensconced in our hotel room (gps got us lost briefly, check in took a while, etc.). We know of someone who has done it in 5 hours, but there were a lot of police radar cars on the road during our trip down. Not a bad trip either; not a lot of traffic, and some nice scenery along the way. 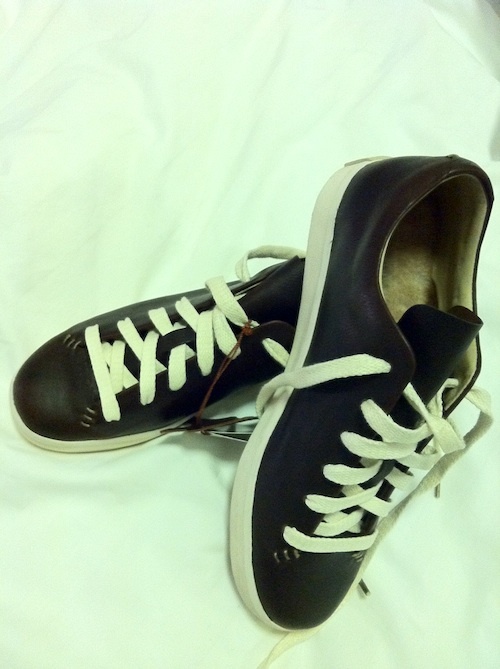 Among her other finds on this trip, Lisa bought a pair of really nice sneakers made out of kangaroo, with sheepskin insoles. They are made by the same company that makes UGGs, and yes, she bought some really funky uggs too! When in Oz, dress like an Ozzie. We came with very little planned. Lisa wanted to stock up on some things she can’t get in Wagga, such as toiletries from Kiehls, make-up from Mac, and look for some clothes such as Mavi jeans, and maybe a new pair of Fluevogs (a colleague told her that Sole Devotion carries them…and they do!). Dan had scouted out a couple of interesting shows at art galleries, and made a reservation at Rockpool Bar and Grill, one of the best restaurants in the country to celebrate our anniversary that was the week before. And we had plans to have dinner with Lisa’s supervisor and his family (he lives here) one night, another of her colleagues who lives here another night, and an old acquaintance from Edmonton, an Australian woman who did her Masters there and we hadn’t seen in several years. Other than that, lots of wandering around, sight-seeing, dining, and just generally soaking up the big city. It has been a successful trip. Lisa found some Fluevogs she liked (and talked Dan into buying some new ones too), and also discovered Trippen, a German shoe company that makes really cool and comfortable shoes. She got some new jeans, and all the toiletries she wanted. And we dined on some spectacular food, saw some interesting art, and enjoyed some beautiful weather and the social events were fun. We’ll report on the food and art in an upcoming post. Though we might not want to live there, it is nice to know that for a respite from inland, rural Australia, this is just a morning drive away and a great place to spend a weekend. But don't worry MO, we'll be coming to Sydney too. But something that we learned is that we have a hard time with the crowds. Wagga isn’t crowded. In fact, it is pretty spartan in terms of people most days, so walking the streets of Melbourne is the most people we have encountered in a long time, easily since our UK trip in June (Manchester, for example, was quite crazy). The congestion, the jostling, trying to walk the streets without being run into, it all gets very exhausting. Though we’ve been having a good time, we don’t think we could live here right now. We came to Wagga, partly, to escape the big city, and find that we are enjoying that aspect of life. Sure, we love being in Melbourne, and will come back here and go to Sydney and other cities in Australia, but the crowds have reinforced our decision that Wagga is the right choice for us right now. I’m really happy to hear that your experiences are positively reinforcing your choice! And…yay! Fluevogs! Yes, we’re liking Aus immensely. And yes, Lisa bought Fluevogs…and so did i (this is Dan writing). But she fell in love with Trippen too. Not sure if they are available in Canada. Can’t remember if you’ve been to Melbourne. It’s a great city – you’ll have to come. I just got a pair of FV BBC’s! Love them. And will investigate the Trippens! Thanks!